As the new year begins, I thought I’d offer a glance back at 2015’s “Sweet Petes” – pipes that have struck a chord with me for one reason or another, or say something special about Peterson pipes, both past and present. It seems the more I study Peterson pipes, the less interesting I find other design aesthetics. Everyone pipeman has a different sensibility, of course, but mine seems to have something to do with what I’ll call design ipseity, by which I mean the essential element the pipe-maker (whether an individual or a workshop) expresses in his or her pipes as a mark of identification. This is more than a logo, a stamp, a particular finish or a shape. It has to do with an entire design language— shapes, stains, materials, design templates, whatever you want to call it—that readily identify the maker in an aesthetically pleasing way. If you were fortunate enough to get a copy of Neill Archer Roan’s Comoy’s Blue Riband, you will immediately get a sense of what I mean—Comoy’s articulated a precise vision in this line of pipes. 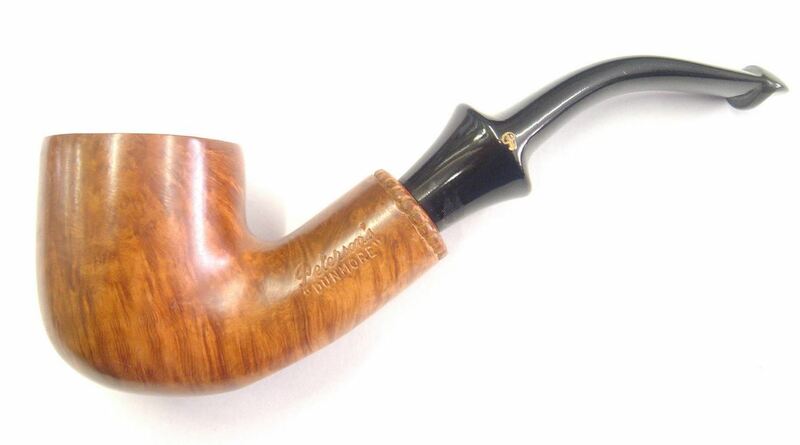 Again, if you know the work of Italian artisan Claudio Cavicchi, you’ll shake your head knowingly: his aesthetic is very geometrical, his proportions larger than other pipe makers, and his expressions in briar quite consistent. Contrariwise, I can kindle little interest in most of the current wave of artisans who simply have no “voice” of their own, but only copy whatever is in vogue. know exactly what I mean. His pipes are instantly recognizable. Contrariwise, an artisan or pipe-maker that lacks such an articulate design language seems anonymous and impersonal to me. What is so amazing to me, often on a daily basis, is how Charles Peterson began back in the 1890s with a few basic design principles, with form following function (as I believe it always should) and his company used these ideas as a foundation to create and sustain a design architecture that allows for continual renewal and growth. More about this in the book—but for now, I hope you enjoy a dozen of my favorite Petes from the past year or so. 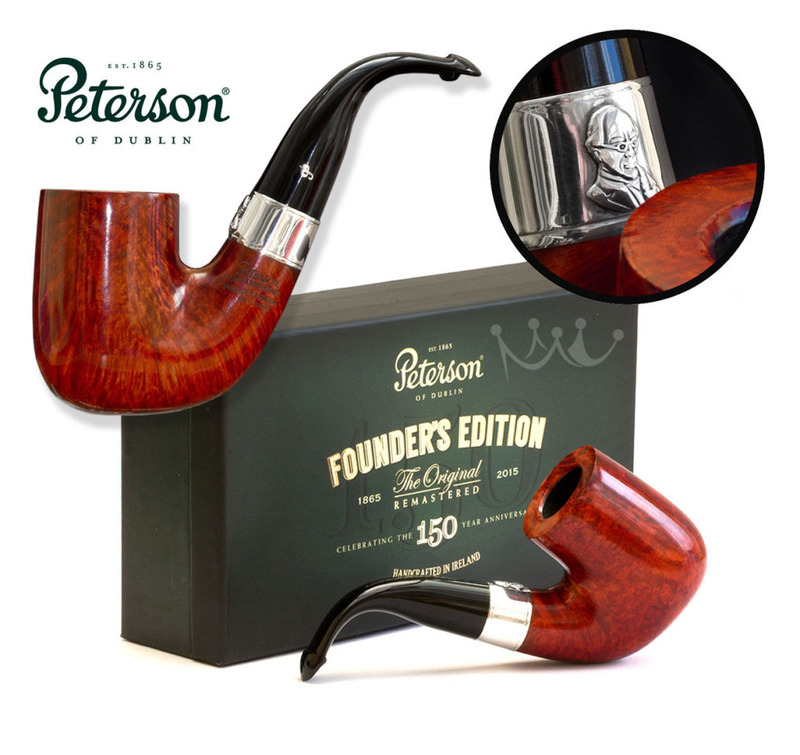 The Oom Paul has a long and distinguished career in the Peterson catalog, and it’s a shame the shape fell out of regular production. 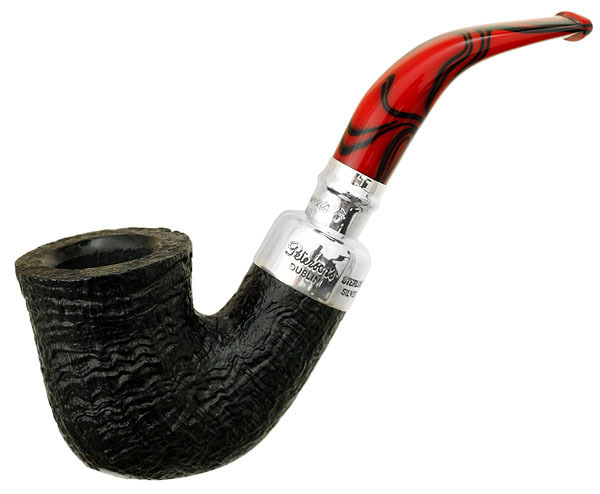 The FE is larger than the XL bowls of the Sherlock Holmes series, with its nearest predecessor being the Patent System Commemorative Oom Paul from 1990. Like all the other Limited Edition / Pipe of the Year pipes, it’s not a System, but it is a really beautiful handful, and I love the Thinking Man soldered silver emblem. Get it if you can find it, is my advice. The Craftsman line debuted in December of 2014 and is a wonderful response to the pipe community’s love for high-grade and artisan pipes. For long-time fans it’s one of the best things that’s happened to the high-end lines. I won’t say it’s overdue because Peterson has always delivered pipes of this quality, but it’s always great to see something fresh. 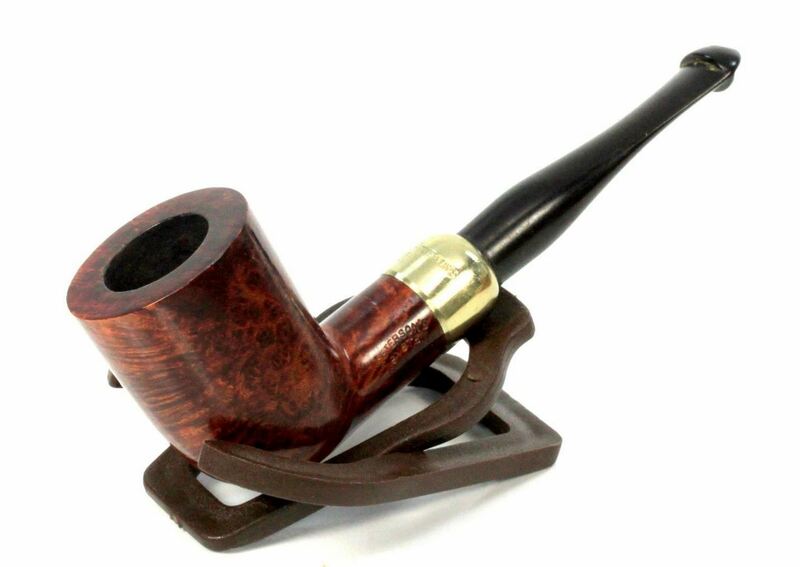 The idea – at least from a fan’s point of view – seems to be to take existing components in the Peterson design palette (bowl shapes, stem materials, silverwork, finishes and stains) and come up with a small, unique batch of dated pipes. The price varies, depending on what’s involved – how much silver, quality of bowl and so on. What has carried from batch to batch (so far) seems to be the spigot mount and a soldered sterling P on either the spigot or the mount itself. I hope this doesn’t mean the end of uniquely themed and shaped collections we’ve seen in the past—the incredible Great Explorers Collection, Writer’s Collection, River’s Collection, Castles Collections and so on—but in the meantime it is heartening to see what the craftsmen and women at Peterson can do. I’m waiting for an issue with an ebonite or traditional cumberland (non-acrylic) stem. 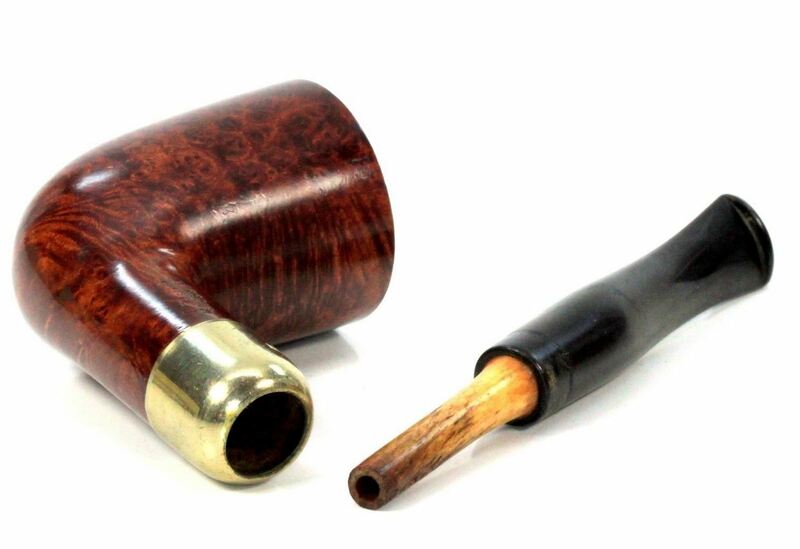 One of the great secrets of Peterson collecting – and I’m not sure I should be broadcasting this on the blog – is the existence of Peterson “one-offs.” A one-off is just what it’s name implies: a one-of-a-kind pipe. Back when Paddy Larrigan was still at Peterson, a number of his creations and experiments were released, sometimes with his “PL” stamp, but more often not. Sometimes I find one-offs to be a little clunky, sometimes amazing, but they’re always unique. My co-author Gary Malmberg, who runs the Secondhandsmokes estate pipe shop on Ebay, tells me one-offs never sell for much because there’s no demand. Hmm. Artisan pipes are collected in part for their uniqueness, even though most artisans make dozens of pipes in the same basic shape. I’m thinking maybe we should change that, because a one-off is as unique for a so-called “factory” pipe as any artisan-made, isn’t it? Then again, maybe not. Let’s keep it to ourselves, at least for now. Sometimes one-offs are stamped SPECIAL. This happens when a customer special-orders a pipe. That stamp, however, can also be used for a small batch, so in and of itself it doesn’t indicate a one-off. I remember owning a 72 Dunmore System back in the 1980s with the SPECIAL stamp. The tobacconist told me he bought a half-dozen from the Peterson rep, who said a small-run, experimental color stain had been used on them. Part of the difficulty with one-offs, of course, is recognizing one when you see it. And that’s probably what keeps them from selling for much. I was lucky to actually get this one, a B35, from Mark Domingues. 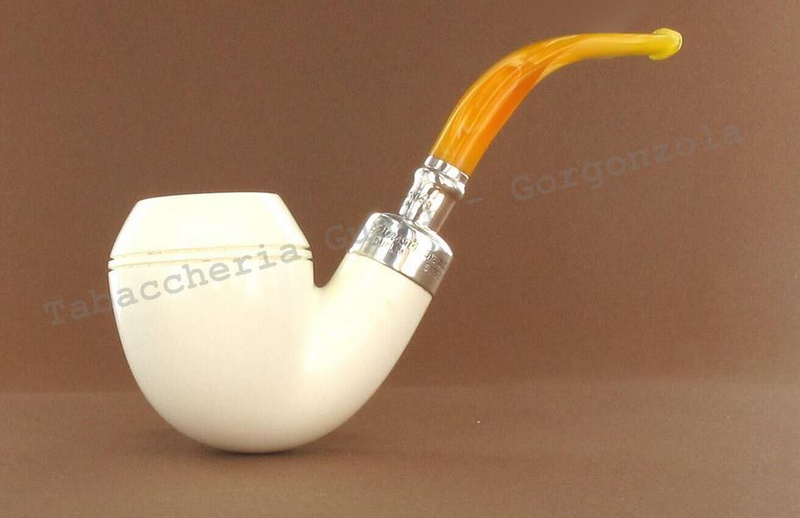 At first glance, it looks like one of the Mario Lubinski Kapp-Royal pipes: light tannish-orange stain, sterling band, amber-colored acrylic bit. But it’s stamped PETERSON PATENT and has a sterling host-and-chalice soldered onto the mount. “Every pipe has a story,” as I love saying, and it turns out that Mark got this pipe from Glen Whelan at Peterson’s Nassau Street shop in Dublin. The band, I learned from Jason Hinch, Peterson’s new silversmith, was made by David Blake (who retired last year). I don’t know why David made it, but ever since reading the Rev. Arthur B. Yunker’s The Theology of Pipe-Smoking back in the 1980s, I’ve held onto the whimsical notion of “holy smoke.” The bowl stamp marks the bowl as intended for the Antique Collection released in 2009, but the stain fits the Lubinski Kapp-Royal pipes. 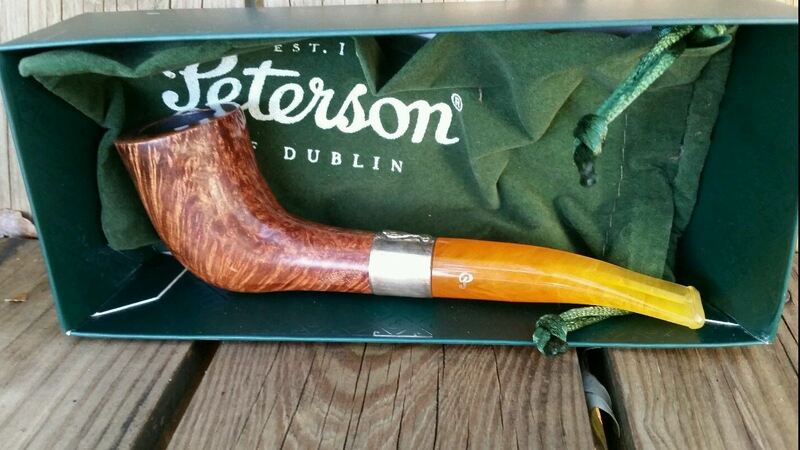 I said in an earlier blog that I think Peterson’s 120 Dublin is the archetype where the Dublin shape is concerned. At some point I want to do a blog on all the Dublin shapes K&P has issued, but for now I will content myself with saying that I have three 120 P-Lips and they all are incredible smokes: a recent-production Aran, a 1980s sterling band Donegal Rocky, and a 1950s Dublin & London. Part of this may have to do with the V-shaped bowl combined with my preferred tobacco—either Dark Star or St. James Woods—but these pipes seem to never require relights and deliver some of the best smoking experiences I’ve had. Length: 5.69 in. / 145 mm. 5.77 in. / 146.56 mm. Weight: 1.15 oz. / 33 g. 1.30 oz. / 36.85 g.
Bowl Height: 1.90 in. / 48.21 mm. 1.95 in. / 49.53 mm. Chamber Depth: 1.18 in. / 30 mm. 1.67 in. / 42.42 mm. Chamber Diameter: 0.85 in. / 21.75 mm. 0.86 in. / 21.84 mm. Outside Diameter: 1.32 in. / 33.62 mm. 1.38 in. / 35.05 mm. I can only find one record of the 120 Dublin System in the Peterson ephemera, in a 1976 Associated Imports brochure. This System shape was probably also marketed before 1949, as seen in an example I had and then sold on Ebay with a COM of MADE IN IRELAND in a circle, which also featured a sterling band, as indicated by the K & P in shields. The one pictured above, with its bone tenon, dates to between 1949 and 1963, as evidenced by the COM, the faux-marks on the nickel band and the fact that bone was discontinued in the early 1960s. Straight Systems are fairly rare in the Peterson world, and perhaps, undeservedly so. In my limited experience with them—a System 31 and an 1890 – 1990 Patent System commemorative—they actually smoke drier than a bent System. But they also “ghost” the tobaccos smoked in them quite easily, and take more care in keeping the reservoir clean and dry. The Irish Whisky line was available from 1997 to about 2005, and while the smooth finish was nice, the rustic has always popped for me and other Pete Nuts. When I saw not one but two of the rustic P-Lip Chubby 107s within a few weeks, I was amazed. Someday one will come around at the right time! I imagine you’re looking at the photo and saying, “I don’t get it. That’s about the ugliest pipe I’ve ever seen.” Well, the thing is that I’ve never seen an actual Peterson Reading Pipe before this one. I owned a GBD churchwarden back in the late 1980s and was never impressed with it, but then I smoked an X.O2 Peterson House Pipe a few years ago from Gary Malmberg’s collection and was astonished with how different the experience was from a short stem. Seeing this one made me wonder how a contemporary Pete with a normal-sized bowl, or even XL bowl, might perform. I haven’t been able to document it, but back in the 1980s pipe-smokers could order a “reading stem” for their System pipes. The stem was $12.50, and inasmuch as a new System Standard retailed for $33, it seemed like a lot, so I never bought one. Of course, I wish I had now—just to be able to document it for the book. I also like the subversiveness of calling a pipe a “Reading Pipe” – nobody reads books anymore, do they? Those things made of paper, glue and board? It seems like Aldous Huxley got it right and Ray Bradbury wrong, at least as far as contemporary culture is concerned. I’ve watched these on the Bonds of Oxford Street Ebay site for quite a while now, and even seen an estate one a year or so back for sale. They seem to have been made in the 1980s, and I suspect they were all a batch made by Paddy Larrigan, although a sales rep at Bonds told me there was no “P.L.” stamp on them. They all have XL bowls and chambers, far too big for my smoking tastes, but I think they’re fascinating in presenting to the world what an Irish free hand pipe aesthetic might look like. So very different from the Danish or German or Italian, but once you think “Irish,” they make perfect sense, at least to me. The Queen! H.R.M. Queen Victoria! 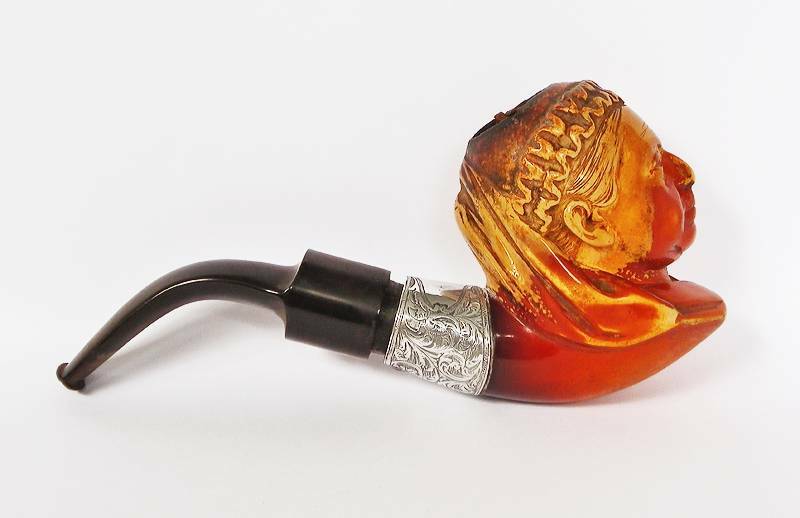 How cool is a meerschaum carved PATENT (that’s a System) Peterson pipe dating from 1896? Well, for me it’s right up at the top, especially with the incredible silverwork. But you won’t see this pipe in the Peterson book, at least not unless the present owner reads this blog and gets in touch with me. One of the constant problems we’ve had with the book has been sourcing illustrations and photographs. I’d say 95% of those involved on the profit side of the pipe-smoking hobby have been extremely generous, some really going out of their way to help us. But then there’s that remaining 5%, and that’s where this pipe comes in. We tried to buy it – which is always, always the easiest way to get the photograph you want – but it went sky-high and we were outbid in the last seconds. Then we tried to arrange with the dealer for photographs, and that didn’t go well. We couldn’t even find out who bought the pipe! In any event, it’s an exquisite piece. Note the “orific” mouthpiece from 1896—the final Patent Lip wouldn’t appear for two more years. IX. What is the Perfect Peterson Briar Pattern? 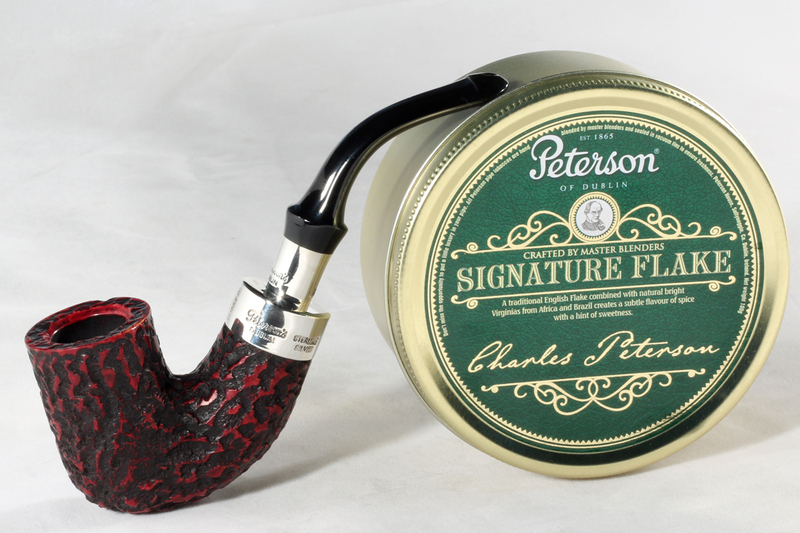 The Writer’s Collection from 2010 produced some of Peterson’s most unusual shapes. With pipes for Irish writers Joyce, Yeats, Shaw and Wilde, the collection succeeds wildly in suggesting the range and power of each of these giants. This egg-shaped bowl with pinched stummel, the Joyce, is a marvel in my opinion. For my money these shapes are flat-out amazing and every bit as dynamic as anything I’ve seen from the high-end artisan makers. But the real reason for including this pipe in my Sweet Petes Gallery is the grain. Peterson pipes have always been made from ebaucheon, not plateau blocks. Closer to the heart of the root, in other words (hmmm, Rush fans, take note). And the very best Peterson grain for my money is a perfect, or nearly perfect, birdseye across both sides of the bowl with tiger striping along the top and bottom of the shank and bowl and the front and back of the bowl. This one’s got it. You always know it when you see it, and some of the most dynamic birdseye can sometimes achieve an almost paisley effect. I sited this one at Smokingpipes right before Christmas, which I’ve noticed over the years is usually the best time at Smokingpipes to find an amazing Peterson shape at a good price. It disappeared before I could figure out my finances the following morning. I try not to share all my pipe obsessions with my wife, but I did mention this one the day I saw it, and I must’ve sounded like a man on the verge, because I did see this pipe again on Christmas morning. The Dunmore System 71 – the same bowl as the 301 System – dates from one of Peterson’s high-water marks, the great creative outburst of the late 1970s and early 1980s. The line featured Premier-grade bowls with a fully-functioning System reservoir, and a flattened area beneath the stummel, allowing it to sit on the stummel and the button. It was the first of Paddy Larrigan’s two System “setter” creations. 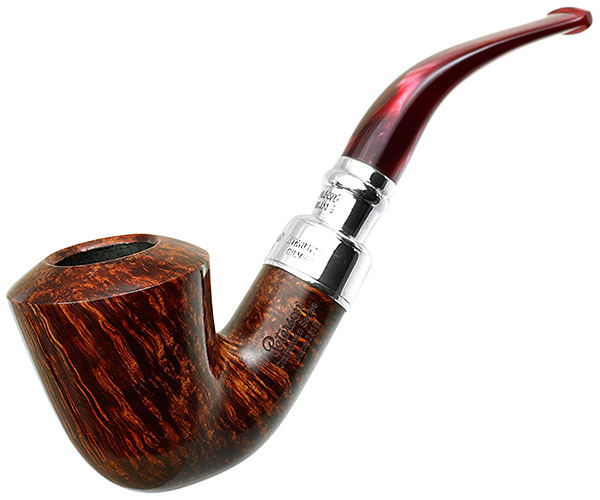 The highlights of the Dunmore Premier System are its ability to sit, its beveled shank without the classic metalwork ferrule (a concession to modernity of the 70s) and its wide “Comfort P-Lip,” which makes it incredibly comfortable to smoke. This bit was discontinued in the early 1990s in favor of a more “one-size-fits-all” bit which is not only much less comfortable but also diminishes the original shape’s chunky masculinity. The Dunmore 71 is still available, remarkably, at Bonds of Oxford on Ebay. Every year Mario Lubinski, Peterson’s distributor for the Italian market and long-time collaborator, releases a handful of what I think of as Peterson special edition lines. I’ll look at what he’s done for the past two or three years in the next few blogs, but for now, something absolutely gorgeous: the Sherlock Holmes shapes in Spigot dress. Why didn’t anyone think of this before? They’re incredible. They almost make me want to smoke a meer, but not quite. 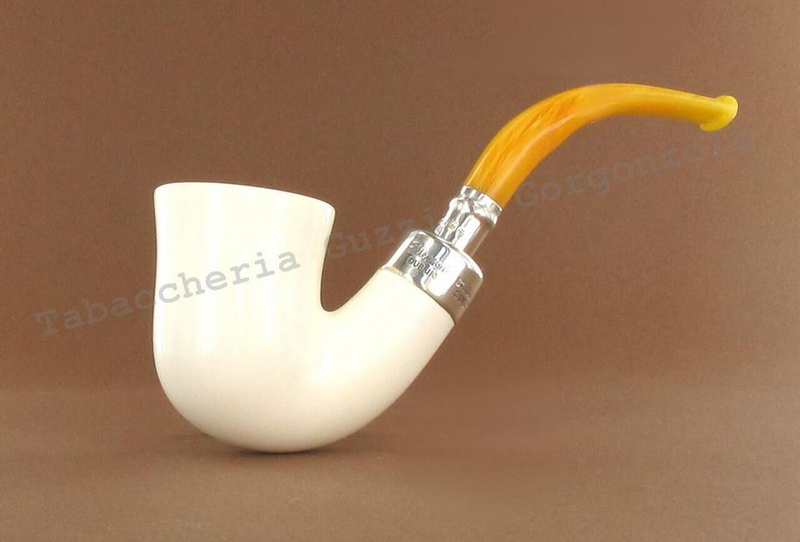 If you’re a meerschaum smoker, however, check these out before they disappear. The Lubinski lines last about 24 months, sometimes not that long, then they just evaporate. I found these, as you can see from the watermarking, at an Italian Ebay site which also posts on the U.S. site. I can’t end without a parting glance at my favorite shape, the old 309 / 4 / 339, which was discontinued in 2013. Toward the end of that year I was doing research on the wide variety of mounts available on early Patent pipes, and one I found very striking—the “F” or “Facing” mount. I wanted to see an XL339 with an F mount (although Peterson doesn’t call it that, or anything else, these days) so I talked to Tony Whelan, Jr. about it. He said they only had a very few XL339 bowls left, and this is what he came up with. I was pleased. *By the way, that marvelous shot of the FE at the top of the blog is courtesy Smokers-Lounge.co.uk, who get in some fabulous Petes. Wow, that’s almost too much to take in at one sitting. I’ll have to go through that one more time, at minimum! The Rush reference made me smile, as did getting your Writers Collection “Joyce” for Christmas! Coincidentally, I noticed a Hand Made listed on eBay this morning, from Bonds but I didn’t know anything about it until I read this blog entry. I see/read a lot of “year in reviews” during this time – this one is a standout! oh, you just have to show these…my mouth watering for a fine 106 or 440 or…I continue to wonder what will come from the minds of Peterson for 2016! A chubby 999/998? or….? Reblogged this on Wandering Pop. You need an easy name like “Al Jones”…. Hmmm… (a) FE or (b) spigot or (c) apology and corrected spelling… I think I’ll choose (d) “pretty stupid” but add (c) as a bonus. Oh, and (e) signed copy of book. Excellent Blog as usual Mark! Can’t remember where I read it (or dreamed it), but are ya’ll and Peterson’s planning a special pipe release in conjunction with the book? Hi Bob, you fortunate man. So is it a 606 or the 104? I was guessing on the shape number, because I don’t think the listing gave that information. Please don’t wait for the book to smoke it! I want to know if it’s really a different experience from the shorter-stemmed pipes. …and as regards the commemorative pipe, yes, you got me to to thinking about it all over again. All I know for sure is that I want it to be a System (natch!) and think it ought to be called “The Peterson STORY Commemorative,” to follow the book’s title. Hi Mark, in discussing with Glen Whelan, he feels it is the 104 Medium. I agree at this point, but still do not have any confirmed dimensions on the long vs. medium 104 reader and am far from expert in such things. It is not the pot shape of the modern 606 – Is the modern 606 shape what you were referring to Mark? I went looking for a 606 named shape in the early 20th century catalog and could not find it. Could you expand on your thoughts on the 606 shape from the period? Glad to here that the commemorative pipe is still on the table – giddy with anticipation! 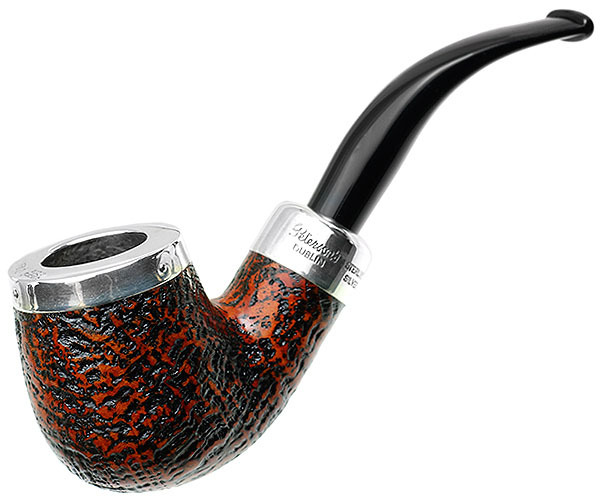 I have been reading and enjoying your blog for some time now, but was prompted to comment only after seeing my second sandblast Founder’s Edition pipe. The first I saw and handled is the one I own, a black sandblast very much like your own. The finish is very thick, more like paint than stain to my eye. The grain on the portion of the bowl smoothed for the nomenclature is completely hidden beneath the thick finish. Indeed, I am not sure the laser engraving really cuts deeper than the finish, a possibility that prompts me to avoid wear to that surface. The second sandblast FE I have seen has the red/black staining typical of a System Standard or System Premier Sandblast. The surface of the wood is obviously not obscured by the finish. I think the blast is less craggy compared to my FE, but otherwise the pipes are largely comparable. The only other difference of note is that the bowl coating on my FE was applied far more liberally than on this other FE. Have you noticed similar variation in the sandblast FE pipes? Yes, I’ve seen a great deal of variation in the blast and the finishing techniques with this pipe. Some are quite beautiful and others quite frankly mundane. I’ve also seen wide variations in quality issues, which is troublesome, because Peterson now has an employee whose sole job is quality control. One FE blast I handled had a sterling band that looked as if it had been kicked around the shop floor, or left in a box of bands for months. I don’t see how it could’ve made it through so many people and out the door. The blast issues could be solved, but only if Peterson went back to doing in-house blasting. They’ve recovered a great deal of their heritage since Tom Palmer assumed direction of the company in the early 1990s, but they aren’t diligent enough in outsourcing quality blasting. 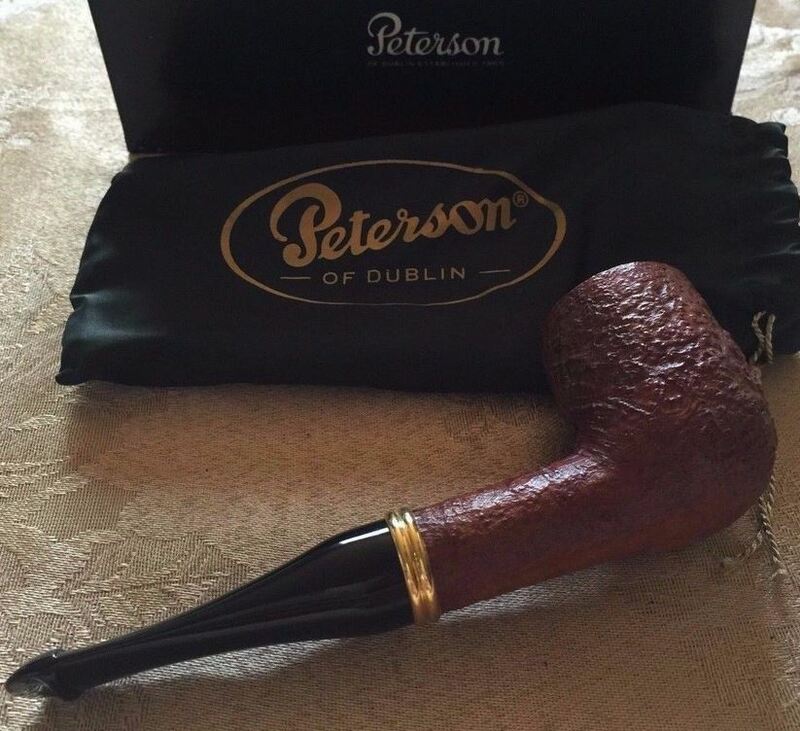 If you compare what Mario Lubinski is able to achieve in his Peterson lines with what we see in the U.S., you’ll see what I mean: Peterson pipes coming through Italy are always a higher grade than elsewhere. 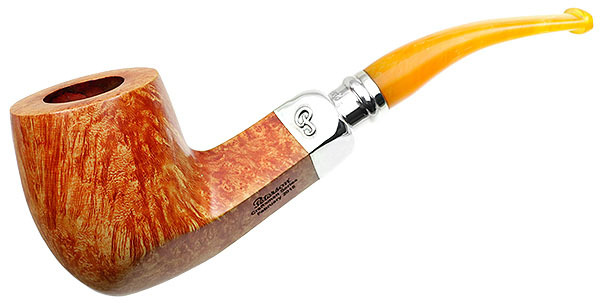 I bought a 309 with a flawless bowl through an Italian source–an incredible grain pattern and no fills whatsoever. Perhaps this was just a mistake on the company’s part? But look at the Rock of Cashel Italian line in person, or the Kapp Royals–some amazing work here. That the variation I observed is not a fluke satisfies one aspect of my curiosity, but leaves me puzzled in another respect. Specifically, how did retailers deal with the variations? I would think that my sandblast FE is of a lower grade than the the sandblast FE with a less concealing finish, but I see no stamping to distinguish the two according to quality. I suppose walk-in-only and online retailers who individually photograph and list each pipe in their inventory would have had fewer difficulties, perhaps opportunities even for differential pricing. I wondered whether Peterson are doing their own blasting. I had read and heard Mr. Palmer’s explanations of bowl and stem sourcing, so I knew that work was not done in-house. Now I know the blasting is also done by others. 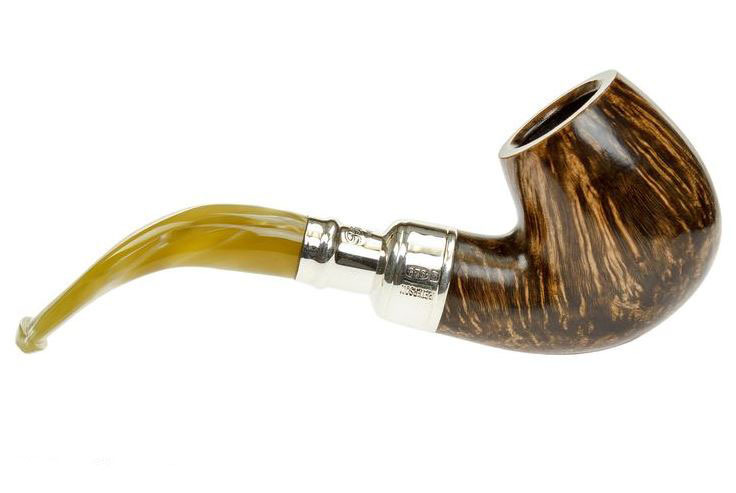 What I have seen in current production ranges from wonderful to bland, but the same could said of current Ashton and Dunhill blasts, just two name two other outfits offering sandblast pipes. The Lubinski Petersons are in many ways a breed apart from what I have picked up from US and Irish retailers. My purchases are by no means numerous, and I have obtained good pieces from the American and Irish retailers, but I have seen enough to feel that the Italian market Petersons are generally a cut above. Two of my sandblast Petersons came from Italy, and they are easily and favorably distinguished from my other Pete blasts. Were it not for your blog I would be unaware that Italian market Petes are different for a reason. I still do not fully understand the Lubinski-Peterson relationship and unique product offerings, but I feel a little clued-in. Isn’t this info a little like telling the world where your favourite fishing hole is? There is good fishing at Lake Ladoga?!!! Meet me there? Sure! I’ll hop the next tramp freighter steaming for the Baltic. I see what you mean about favorite fishing holes Linwood, but I’m cursed with an “abundance” model when it comes to anything fun–I hate to deprive anyone else of the opportunity, especially if I can’t have it. And with Peterson pipes, there’s nearly always enough to go around if you’ve got that “fisherman’s mindset.” I just found a half dozen incredible new/old stock pieces & I’ll tell everyone in Monday’s blog where to go — if I’m not going to buy them, I want someone else to benefit. Buroak, the Lubinski-Peterson relationship is just a heightened version of what they’ve done since the Industrial Exposition of 1895 in London–they work with trade partners, some of which have been with them since 1912 (! ), and when these partners say, “Hey, could you make this for us?” Peterson’s answer is always “Sure. Why not?” Mario has just taken it a step farther, visiting the factory almost every year and working with the artisans there to create what he wants.